Heuglin's Masked Weaver was formally described by Anton Reichenow, a German ornithologist and herpetologist. Heuglin's Masked Weaver was collected by Martin Theodor von Heuglin, a German explorer and ornithologist in north-eastern Africa. He collected a large number of birds, including new species, in East Africa. In 1861 Heuglin led an expedition, starting from Massawa in Eritrea, towards Khartoum via a wide detour through Ethiopia. In 1863 Heuglin continued from Khartoum to explore a great part of the Bahr-el-Ghazal river in South Sudan. The Bahr el Ghazal, meaning "sea of gazelles", is a tributary of the White Nile. Heuglin described this species in 1864, soon after returning to Europe from NE Africa. However, he named it as Textor atrogularis ("black-throated"), a name which had already been used for the Black-necked Weaver by Voigt (1831), a name no longer valid for the latter species, but nevertheless one that cannot be used for Heuglin's Masked Weaver. This error was realised by Reichenow, who re-named Heuglin's Masked Weaver in honour of Heuglin. 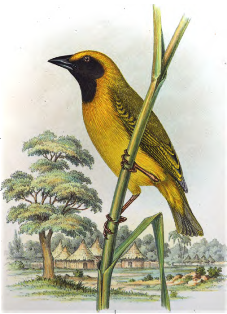 The first illustration of the Heuglin's Masked Weaver was of the type, published by Heuglin (1869), repeated in 1871. The second illustration for the species was of the egg, in Heuglin (1873). Ploceus heuglini	Reichenow 1886,	Zool. Jahrb. I, p.147,	Bahr-el-Ghazal, Sudan. heuglini, After Theodor von Heuglin (1824-1876) German explorer, ornithologist, and author. Plain-backed Masked Weaver, Senegal Masked Weaver. Gazellenfluss=Bahr el Ghazal, South Sudan. There are at least one type (in the Leiden Museum), but there may be more syntypes.